Tiguan’s standard 200-horsepower 2.0-liter turbocharged engine delivers good acceleration but lackluster fuel economy; in 50 percent city driving, we averaged about 22 mpg — just a bit better than the EPA “Combined” estimate — which is low for a compact SUV. It’s unfortunate that the entire Volkswagen organization has been marred by the actions of a few top executives, because the company’s products have an awful lot going for them. 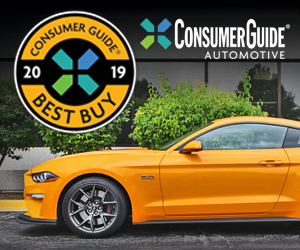 In fact, two of them – the GTI and the Golf Sportwagen – are multiple-year winners of Consumer Guide “Best Buy” awards. Right up there with them, in my book, is the Volkswagen Tiguan (pronounced, “TEE-gwan”). 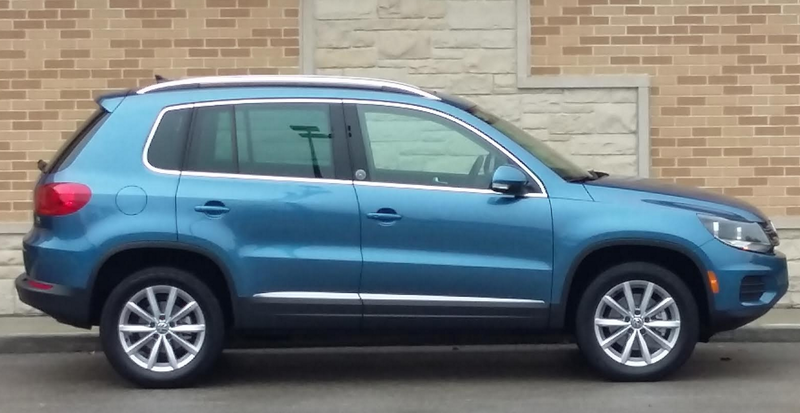 While I’ve always questioned VW’s strategy of giving its SUVs unknown names (“Tiguan” is a combination of the German words for “Tiger” and “Iguana,” while “Touareg” – VW’s large SUV – is named for a nomadic tribe in the Saharan desert), I don’t much question the engineering put into them. As with most VWs, Tiguan bridges the gap between “regular” models and “premium” ones. In the compact-SUV class, that puts it between vehicles such as the Honda CR-V and the upscale Audi Q3 and Q5 in terms of refinement and price. And it fits in that slot quite nicely. We covered a 2016 front-drive version of the tested vehicle in a previous Test Drive review, so here we’ll concentrate on what’s new for 2017 and touch on some highlights. Tiguan’s model lineup is shuffled this year to include S, new Wolfsburg and Sport, and top-line SEL; gone are the previous SE and sporty R-Line models. 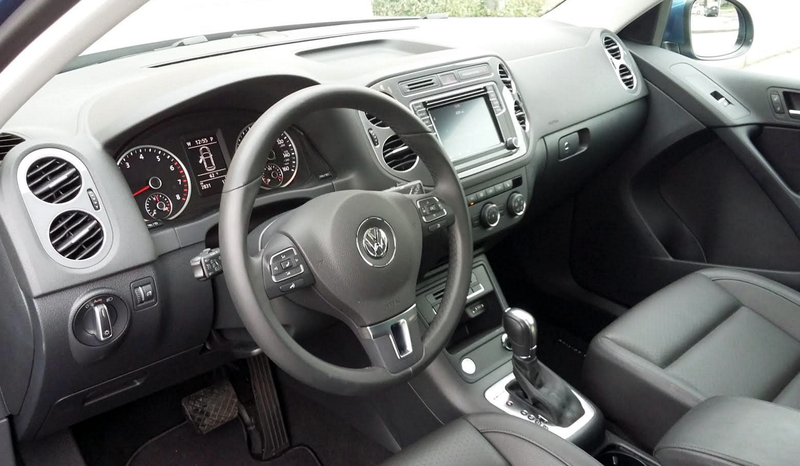 Added standard features include Volkswagen’s Composition Media Infotainment system, which includes a 6.3-inch touchscreen, USB port, Bluetooth, Apple CarPlay and Android Auto, two SD-card slots, and satellite radio with a 3-month trial. Also newly standard are keyless access and starting, leatherette upholstery, heated front seats, heated washer nozzles, automatic headlights, auto-dimming mirrors, and rain-sensing wipers. Added on the tested Wolfsburg Edition are roof rails, panoramic sunroof, power driver-seat lumbar adjustment, and manual front passenger-seat lumbar adjustment. Oftentimes, being a “tweener” is a tough row to hoe, at least in the automotive world. Your prices are higher than the high-volume makes, and your name doesn’t carry quite the panache of the premium brands. 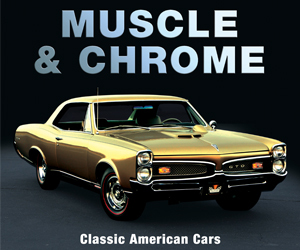 (Others filling that gap – and quite successfully – are Buick, and to a degree, Acura.) What it means to a buyer, however, is that you can often get a superior vehicle at a relatively bargain price. It looks a bit bland in all black, but the Tiguan’s interior offers a great combination of room, nice materials, easy-to-use controls, and comfortable seats. Let’s begin with cost. The base front-drive Tiguan starts at $25,860 including destination, about $1100 more than a Honda CR-V – hardly a big hit. But most compact SUVs are now ordered with AWD, and that adds a nearly $2000 to the Tiguan, while it only adds $1300 to the Honda. Yet if you compare the base Tiguan to the base Audi Q3 (admittedly with more equipment), the VW comes in at nearly $7000 less. Then the question becomes, “What makes the Tiguan worth the extra money over a CR-V?” And it’s a good one. It’s hard to compare the two in 2017 versions, because the CR-V is being redesigned this year and hasn’t yet been introduced. So we’ll just look at what the Tiguan offers. Standard in the Tiguan is a 200-horsepower 2.0-liter turbocharged engine mated to a 6-speed automatic transmission. While that horsepower figure is higher than that of most compact SUVs, it really doesn’t tell the whole story. Like most turbos, the real benefit comes in torque output, which really means more in normal driving. 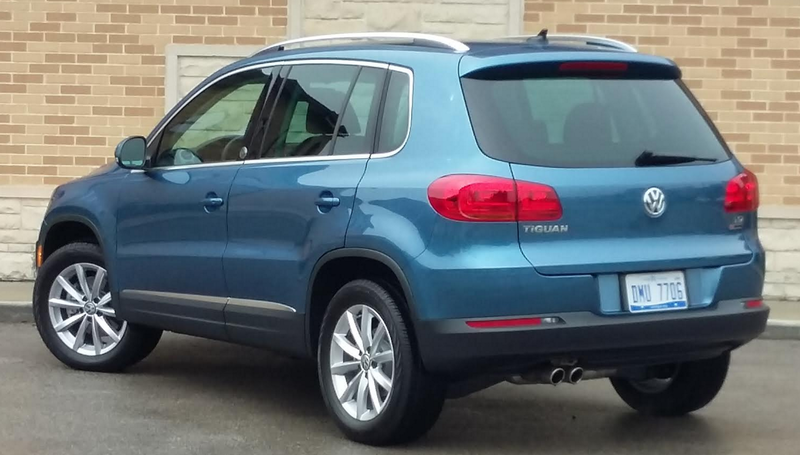 In the case of the Tiguan, it comes out to 207 lb. ft., whereas the 2.4-liter non-turbo engine in the 2016 CR-V (which is expected to carry over with few changes) makes 181 lb. ft., and it arrives much higher in the rpm range. In the case of the Tiguan, this results in just a hint of turbo lag in a full-throttle start, followed almost instantly by a strong surge of power. And the same holds true for acceleration at higher speeds, but without the lag. Another benefit is the Tiguan’s conventional 6-speed automatic transmission. While some rivals (including the CR-V) are going to CVT automatics for their better fuel efficiency, some folks don’t care for the CVT’s driving characteristics – often described as suffering a “rubber band” effect under acceleration. But the Tiguan’s automatic not only behaves in a conventional manner, but it kicks down quickly when the throttle is nailed at speed. On the downside, Tiguan’s EPA ratings of 20 city/24 highway pale next to the base CR-V’s 26/33. Another point in the Tiguan’s favor is ride quality. The previous 2016 model was driven in Phoenix, which really doesn’t suffer the kind of “challenging surfaces” (aka “craters”) found around our Chicagoland headquarters. But this 2017 version was driven in the Windy City, so it was given a harder test. Which it passed with flying colors. Tiguan’s cargo area is narrow at the rear (it’s unlikely golf clubs would fit crosswise), but it’s spacious, with a large opening and cubic shape. 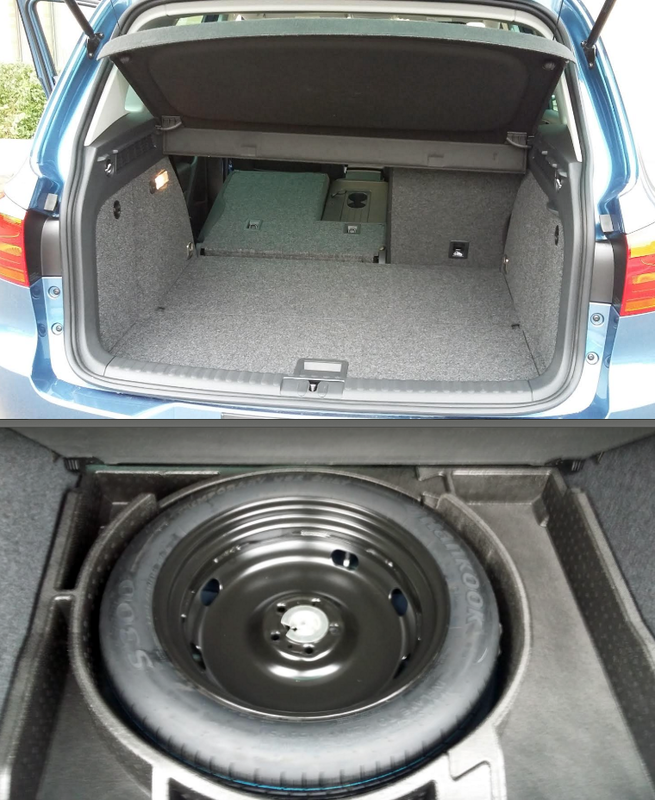 Folding the rear seat backs results in a flat load floor, and there’s lots of nicely padded space beneath the floor. This is not to say that it rode like a cushmobile. The suspension is still on the firm, controlled side, but it absorbs bumps with little fanfare. Also with very little noise, which otherwise tends to amplify the effect, if not the actual feel. In all, it makes it seem as though you’re driving a very refined vehicle that cost far more than it did. That impression extends to the interior. While it looks rather subdued in these photos, the materials are of high quality, with many padded surfaces and no cheap-looking plastics, and there’s plenty of adult room both front and rear. Furthermore, the driver seat has 4-way power lumbar adjustment and the front-passenger seat has manual lumbar adjustment, both unusual in this price class – and for some, very beneficial to comfort. There’s a good amount of interior storage space, the audio and climate controls are easy to use and reach, and visibility is good all-around, aided when backing by a standard rearview camera. Storage space in back is good, too, though the cargo area is rather narrow. The 2nd-row seat backs lie nearly flat and level with the cargo floor, and there’s a large amount of under-floor storage in nicely padded partitions. 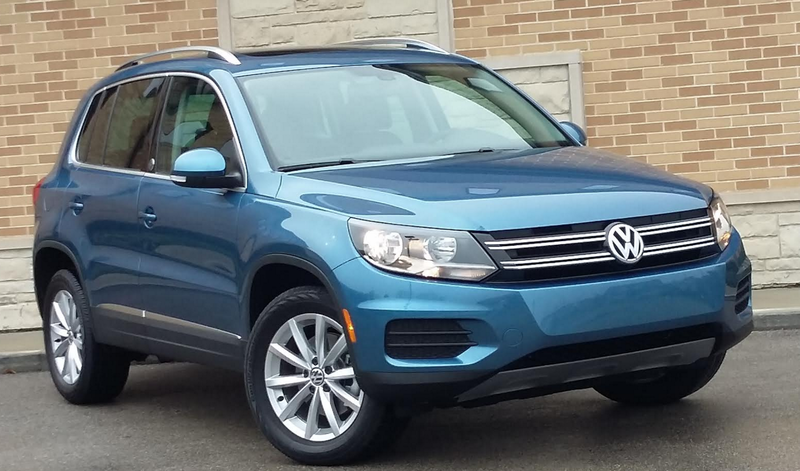 Compared to the most popular vehicles in the compact-SUV class, the Tiguan is a slow seller. But it really shouldn’t be. It’s both sportier and more refined than most competitors (or in the case of the latter, nearly all), and it projects a certain stately, Teutonic air that puts it in a class by itself … unless you want to spend a whole lot more money. It’s probably not the first vehicle that pops to mind when you think “compact crossover,” but the refined and sporty Tiguan deserves strong consideration — even if you didn’t know it existed. Written by: The Daily Drive staff on November 29, 2016.on March 22, 2019.